Discussion in 'R4 DS' started by floattube, Jun 15, 2013. I put firmware on the card and start the DS, on the menu it has Spongebob Atlantis Squarepantis. If I select that, it will go to a white screen then freeze. It is really frustrating me. You shouldn't have bought a clone. 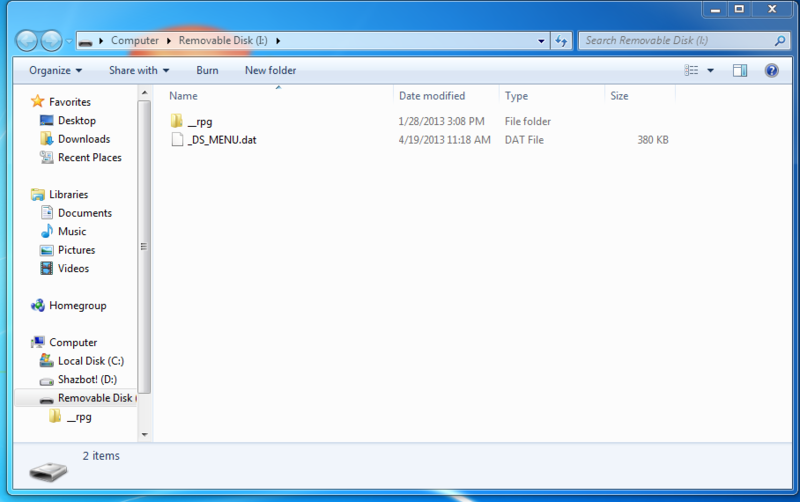 Screenshot what files on the the MicroSD look like. There isn't anything on it now, I formatted it using the Panasonic tool. Also, what is a clone and is it still usable? You need to have the kernel/os/menu files on the MicroSD for a flash cart to be usable. Get them from the site printed on the cart. I know that... They didn't work so I formatted. I need help finding kernels that work. Wood doesn't work and neither does the one on the website printed on the card. Some teams have multiple models, try various downloads on the site. Nope, nothing. I'm really stumped. My micro SD card should be supported, it is a SDHC 16 GB. Did you try the top three or four model downloads? I tried all of the ones available at their website. Screenshot the files as they are on the MicroSD so we can see if the software is set up correctly. If you're sure, I'd return the cart to the shop you bought it from and get another (preferably one of the suggested carts from the main flash cart section's sticky), it sounds like that one has the wrong sticker on it or something. Screw it, if anyone can link me to an R4 card that: cost under $20 and supports 16GB SDHC card, please link it. I'm done with this fake card. Hunh, that looks like Wood, and yeah Wood doesn't run on clones. Sounds like the firmware update didn't finish properly. You'll need another flash cart and a DS/Lite in order to update the old one via a cart swap. Oh? How do I do that? I was worried that was it. It said power cycle after upgrade complete, so I power cycled. 1 - Put a working cart with the update file for the broken one in the DS. 2 - Start it up, start the upgrade file. 3 - Take the working cart out, put the broken one in without turning the DS off. 4 - Tell it to do the update. Ok, I did that, but for some reason it's stuck on erasing device. Make sure to swap the MicroSD as well?